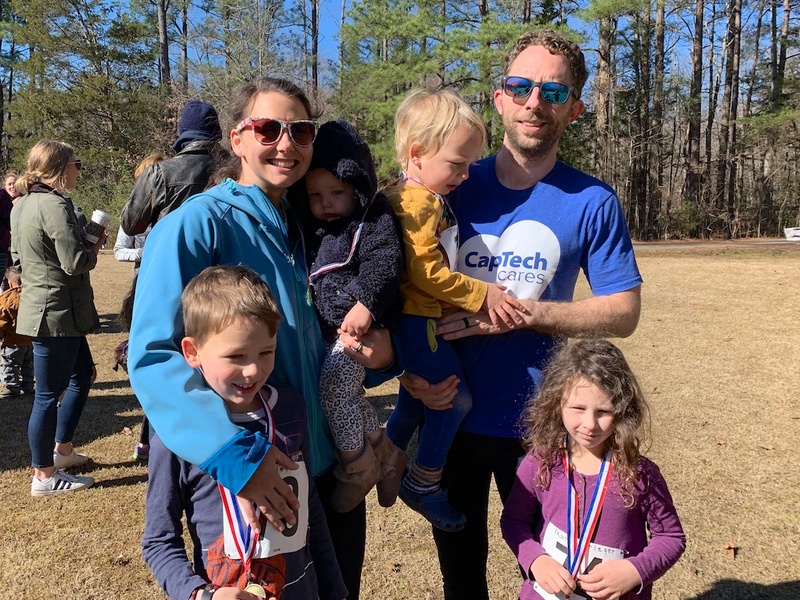 Last Saturday our family laced up our racing shoes and participated in Thomas’s preschool 5k. We’ve participated in this race every year since David started preschool. Annual events always cause me to reflect on how my family has changed through the years. We’ve done this race with different combinations of toddlers, babies, and big kids. 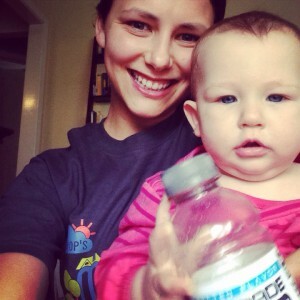 I’ve run the race pregnant, postpartum, and I’ve cheered on the sidelines because I was too pregnant to participate. 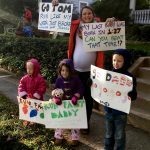 And then there was last year, when I had the flu so Tom went to the race solo with all four kids. This is the first year I haven’t been directly involved with the planning and I’m not at all joking when I say it was the best year. Here’s the thing, it’s important to know your strengths. Planning is not one of mine. 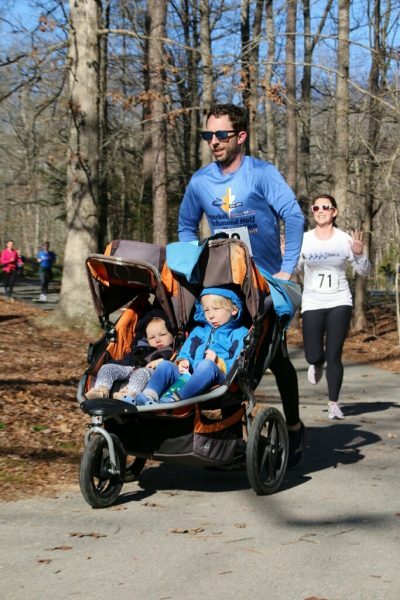 Coercing your husband into pushing the jogging stroller and running a 5k with you? I’m awesome at that. Tom and I ran the 5k together and I was prepared to hate every step. Before the race I told him that if he even CONSIDERED the following — Wow, is this really how fast you’re running? Look! I can walk as fast as you run! Come on, let’s run faster — that I would push him into the pond. We honestly had a great time. 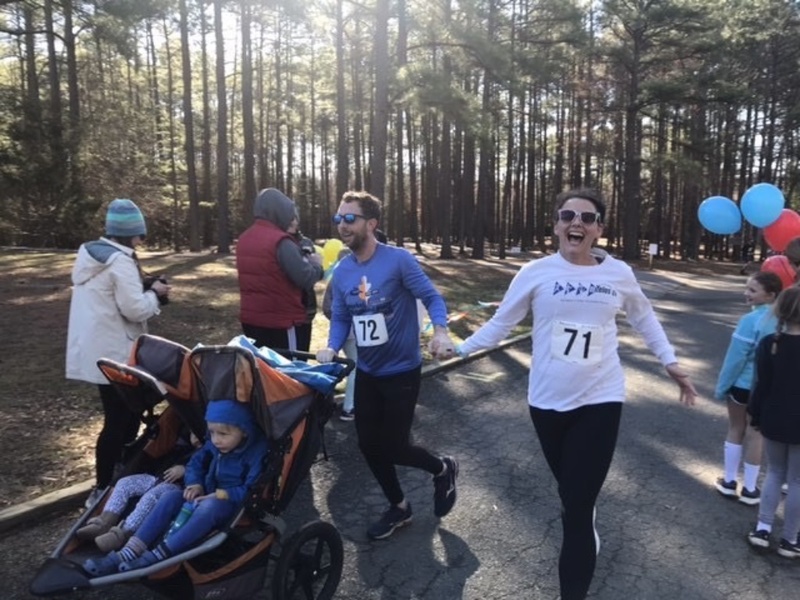 I haven’t fully gotten back into running since Anna was born, and I’m still dealing with some postpartum creaks, and so I was really happy that the run wasn’t too rough. Plus, even though we technically had two of our kids with us, it felt like quality time together. A date! The big kids ran the mile race. 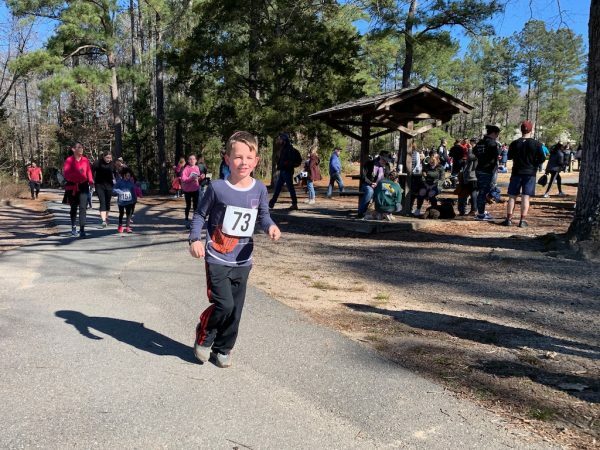 Honest to goodness, I never relate to a child more than when they’re mid-way through a mile run. The kid begging to stop? Been there. The kid going out too fast and bailing after 50 meters. Yup, that’s me. The little girl in a princess dress with tears streaming down her face? It’s like watching my soul. David was PUMPED and determined to FLY. Mary was CAUTIOUS and just hoping to SURVIVE. I get it, kids. 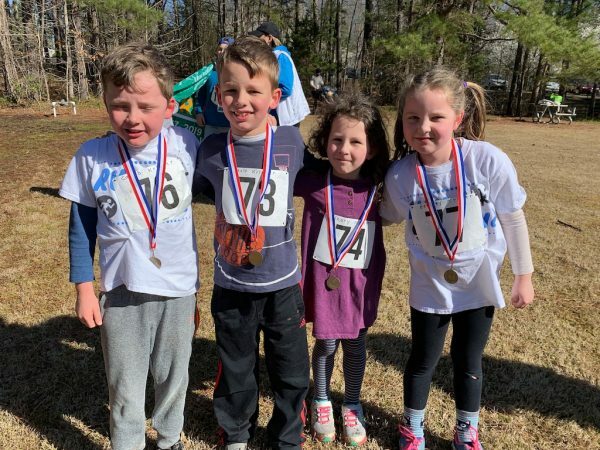 David and Mary did great, and they ran with their cousins Caleb and Berkley Grace. I don’t want to brag TOO much, but in the race they did all the things I am most proud to see: they worked hard, they persevered, and they cheered for their friends. Before I paint too much of an idyllic picture, let’s head over to the preschool dash with Thomas! Thomas was NOT INTERESTED in participating, and he let us know by screaming and refusing to stand up. Why, kid? It’s just a jaunt across a field, why are you choosing this hill to die on? I suppose the only answer to this is that three-year olds die on every hill. In fact, if there is a hill, a three-year old is dying on it. 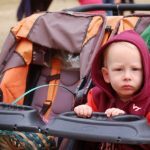 They started the kids in waves, older preschoolers first followed by the younger preschoolers. Thomas was in the younger group and he was furious about this, too. He went from not wanting to run to not wanting to wait. Once their race started, Thomas’s cousin Psalm darted in front of him and GUESS WHETHER OR NOT HE WAS HAPPY ABOUT THAT!?!? 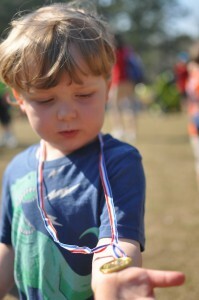 Just like David the first two years he participated, Thomas didn’t finish the race. I carried him over the finish line. They still gave him a medal and unlike David, who refused to wear a medal he didn’t win, Thomas snatched his medal pranced around like Usain Bolt. 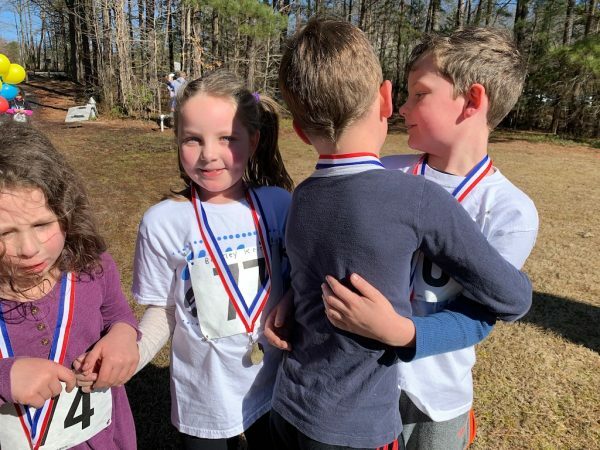 Anna got a medal, too. She technically didn’t run a race but the morning was a family affair and she was absolutely a member of the team. 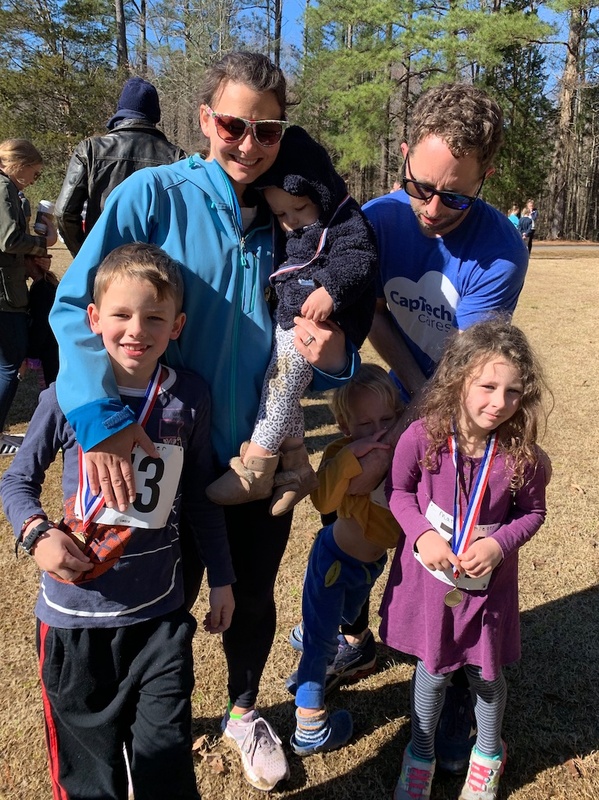 I wanted to memorialize the morning with a family photo — all of us with our medals and race numbers and tired eyes. Guess whether or not Thomas wanted to participate. Oooh, Mom wants a picture! Look! Another hill! 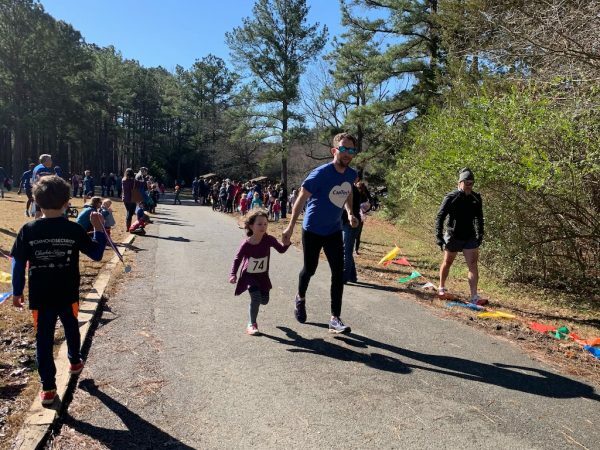 Preschool Race 2017, when I was pregnant with Anna and didn’t know it yet! When they were very young, I think David and Mary looked like twins of Thomas and Anna. I’m not a runner. I’ve tried. People tell me it is the endorphin rush that makes it pleasurable. I must have broken endorphins, or very slow ones, because mine don’t rush. In fact, I don’t think they move at all. The waterpark on post has a lazy river. Some of the soldiers run against the current for the PT. I asked the director about walking, and we are allowed to walk it during the adult swim periods. I like it. I can do so much more in the water. I completely agree! I sometimes joke that I could interchange the kids’ baby pictures and no one would notice! I’ve actually read that the endorphin rush that comes with running is actually overstated — that you have to run pretty far (like 60 min) for the endorphins. Don’t quote me on that, but as a runner it makes sense to me. 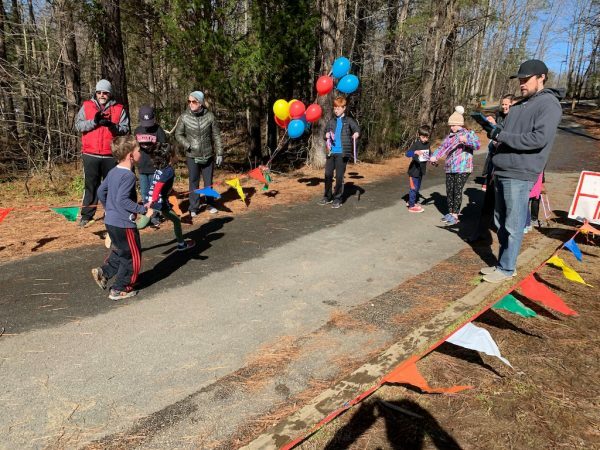 Most runners would tell you that you don’t get into the flow for a few miles. What I’m saying is — you sort of have to like it to do it. It’s not for everyone! But the waterpark sounds amazing. Do what you love!